It is exciting to see the push back to SOPA and PIPA that is being communicated today via various forms of protest on the internet. We would blackout our website here at Lions of Liberty, but then where would you find comparisons between SOPA, PIPA, and NDAA Section 1021? Lions of Liberty provided our insights into SOPA and PIPA earlier today and twice last fall, here and here. In addition, to these two liberty eroding bills there was a third signed weeks ago that makes SOPA and PIPA look like weak attacks on our rights. The National Defense Authorization Act contains provisions that align the United States with totalitarian countries such as China, North Korea, and Cuba. NDAA, which President Obama signed into law December 31, 2011, contains the language that will forever change the United State of America. Section 1021 of the bill essentially gives the military the right to detain American citizens indefinitely, without charges. This law goes against everything this country has been built upon. The President and Congress have thrown the Constitution and the Bill of Rights out the window. We no longer live in a free country and had SOPA already passed, you probably wouldn’t even know about it. 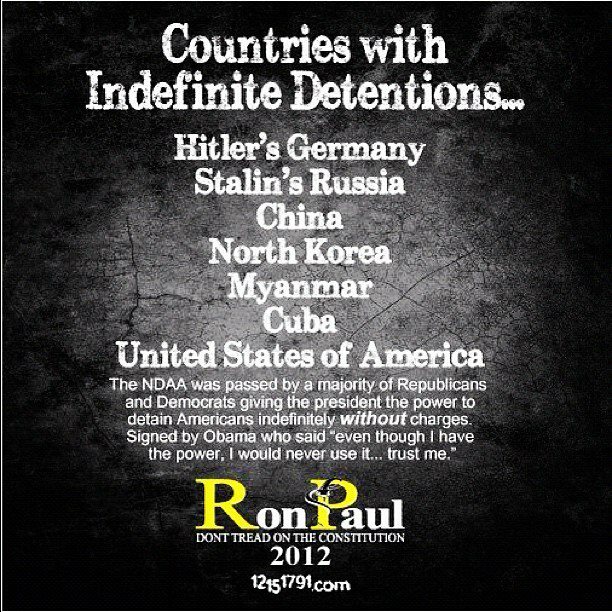 Please take 5 minutes and watch Ron Paul’s historic Congressional floor speech condemning Section 1021 of the NDAA. Personally, I agree with just about everything Ron Paul says. I understand if you have some issues with some of his policies, but as a whole he might be the last hope to restore liberty. It’s time you take a long, hard look at the state of this country and decide what is important. Do you want your children to live in a free society and enjoy the same opportunities that you have? We already know that Barack Obama has zero respect for your personal liberty. He has proven that by signing the NDAA. Mitt Romney said during the last debate that he supported the government’s right to indefinitely detain American citizens without charge. This country has reached a fork in the road, will you choose liberty or tyranny?